Early this spring I was asked if I would make a batch of cupcakes for a friend to bring to work before he went off on his paternity leave. His only stated wish was that the cupcakes would have a Star Wars theme, and so I ended up with a dark vs. light side concept: these lovely dark chocolate cupcakes with marshmallow frosting and marshmallow stormtroopers vs. blondie cupcakes with raspberries, salted liquorice frosting and miniature stars and lightsabers made from homemade fondant. 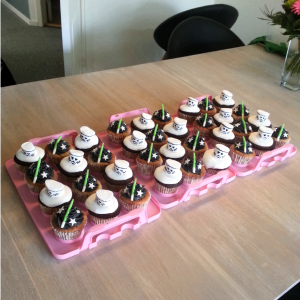 The complete batch of Star Wars cupcakes ready for pick-up! The chocolate cupcake is my go-to recipe by Sally’s Baking Addiction – a moist and super delicious cupcake with a rich chocolate flavour and a beautifully rounded top (be sure to use conventional heat as convection heat may cause the top to collapse as on the top picture – unfortunately I only got a chance to take close-ups of my second sorting cupcakes ). 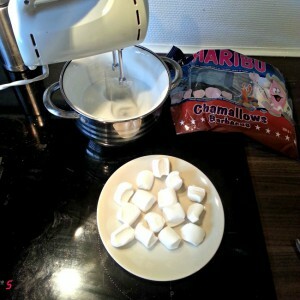 The recipe for the marshmallow frosting I arrived at through several experiments. I wanted to try a recipe by Annettes kager, a Danish cake blogger whose recipes I’ve found to be reliable, but couldn’t get my hands on glucose in crystalised form when I needed it – the local stores only offered a syrup version. 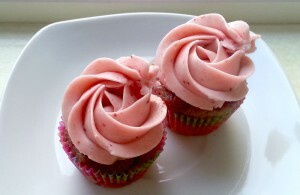 So I tried a few recipes using glucose syrup, but found that the frosting would either collapse rather quickly or become so viscious that you could hardly bite or cut into it without making a mess of the cupcake. And so I went with a third option and decided to use melted marshmallows for my marshmallow frosting. Ingenious, right? 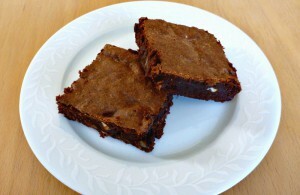 Well, actually I’m not the first person to get this idea, but again I didn’t have much success with the recipes I tried. But this one I think works quite well – it has a lovely vanilla flavour and is chewy like a proper marshmallow should be, yet you can easily bite into it without spoiling the rest of cupcake. 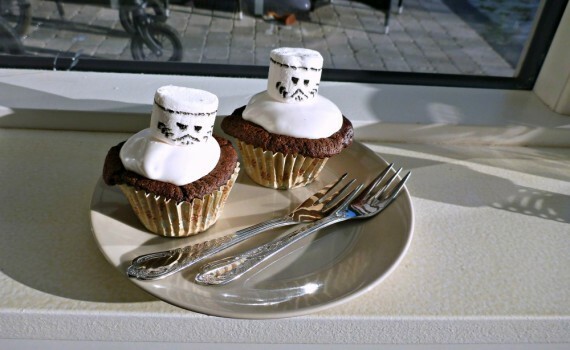 For the decoration I drew stormtrooper heads onto marshmallows with an edible marker – who says not to play with your food? Preheat the oven to 175 degrees C and prepare a standard-size muffin pan with 12 paper liners. Combine the butter and chocolate in a bowl and place it over simmering water. 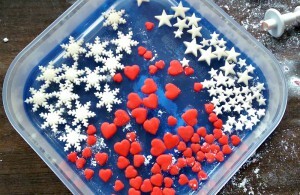 Allow to melt and stir to get a smooth mixture. Remove the bowl from the heat and allow to cool. Sift cocoa powder, flour, baking powder and baking soda into a medium-sized bowl and mix gently. Set the bowl aside. Using a hand or a stand mixer fitted with the paddle attachment, beat eggs, caster sugar, brown sugar and vanilla extract in a large bowl until you have a thick, smooth and airy mixture. Add cooled butter and chocolate and beat again to incorporate. If using a kitchen machine, set it on low speed and add the flour mixture in three additions, alternating with buttermilk. Beat after each addition until just incorporated – be careful not to overmix! If using a hand mixer I recommend that you use a wooden spoon or similar to gently fold in the flour and buttermilk instead. The batter will by now be quite thick. Divide it evenly between the 12 paper liners and bake for about 18 minutes until a toothpick inserted into the middle comes out clean. Remove the cupcakes from the oven and allow to set in the pan for a few minutes before placing them on a cooling rack to cool off. Your cupcakes should be completely cool before you add your marshmallow frosting. Combine egg whites, sugar and salt in a medium-sized heat-resistant bowl. Use a hand mixer to whisk for ab. 1 minute until the mixture starts to foam. Place the bowl over simmering water – be sure that the bottom of the bowl does not touch the water – and whisk for ab. 7-8 minutes until the sugar has completely dissolved and the mixture is firm enough that you can make small peaks. 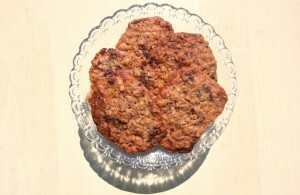 Use a spatula to scrape down the bottom and sides halfway through to incorporate any sugar grains sticking to the bowl. Add the marshmallows a little at a time, whisking in between. After adding all the marshmallows whisk until they have dissolved. Remove the bowl from the heat and place it in an ice water bath to help it cool off faster while continuing to whisk. Add a little water – start with 1 tsp – and whisk until the marshmallow frosting is cool. The cooler it gets, the firmer it becomes as the marshmallows start to congeal again. If it seems to get to firm and cheewy, add a little extra water.